Looking at these very 1920's faces with their very 1920's hats, you can practically hear "The Charleston" playing in the background. 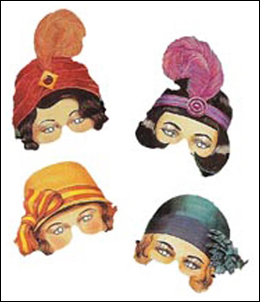 At your next costume party or for Halloween, help your guests get into the 1920's mood with these fun accessories. 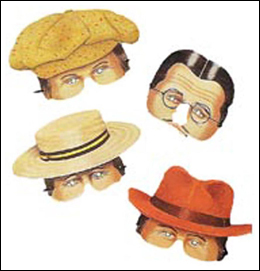 The set of 8 different masks (4 female, 4 male) are made of full color, heavy cardboard. Each one averages 12" wide by 10" high. Meant to rest above your nose, and held on by black ribbons, the design will allow you to drink that champagne or bathtub gin.